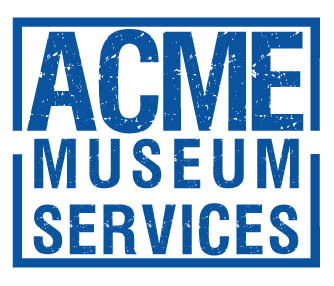 Welcome to the Acme Museum Services website. This WHAT? 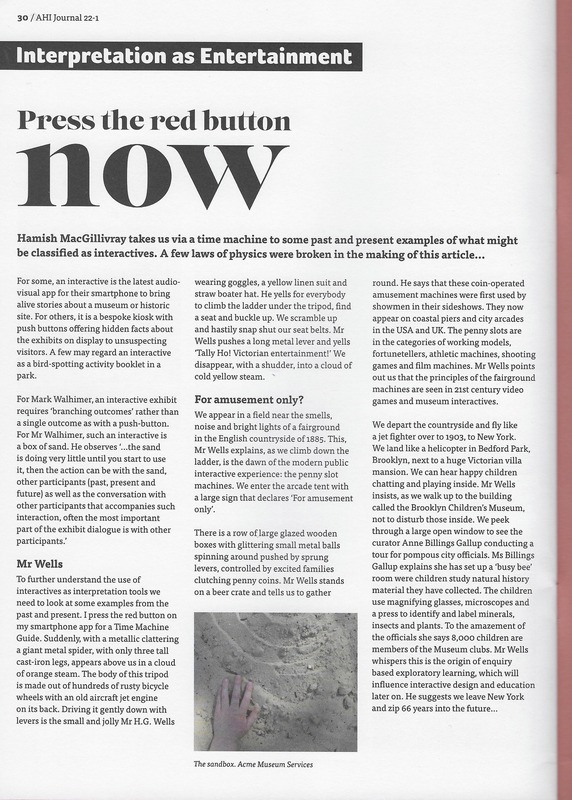 page features some rambles, observations and pictures of some of the current work by me, Hamish MacGillivray, in the heritage and arts sector. Use the menu to find out more about my career WHO? Some free resources on WHY? and on WATCH! view some audio visual slideshows I have created. To contact try or call on 07811 144622. Some more visitor evaluation for Chartwell (National Trust) former home of Winston and Clementine Churchill. We were looking at Winston Churchill’s medals case display. Should we use digital tablets to help tell medal stories and provide extra seating? My colleagues interviewed visitors then I gathered all the findings and had a think how to present them. I used cheap ComicLife software to produce this summary. The great advantage of using this rather than a spreadsheet is that I can quickly use quotes from visitors. And speech bubbles are a great way to edit long text as you can only fit in about 10ish words per bubble. This visual comic style document is very useful in planning meetings. It also keeps funders happy as evidence of work in progress. This month (December 2018) I have been busy helping with visitor room testing at Chartwell. One of the rooms that we tested with visitors was the former Secretaries Office. This has been described as the hub of Chartwell as it was a very important commuications centre for Winston Churchill. It usually had two secretaries staffing it with typewriters and a telephone switchboard from the 1920s to 1960s. As well as testing audio-visual kit (audio slideshow or Pathe newsreel worked well) I loaned my old student manual typewriter. And it was a hit with visitors. Children and younger adults were fascinated with the simple technology and actually surprised by the physical part of finger bashing on the keys. 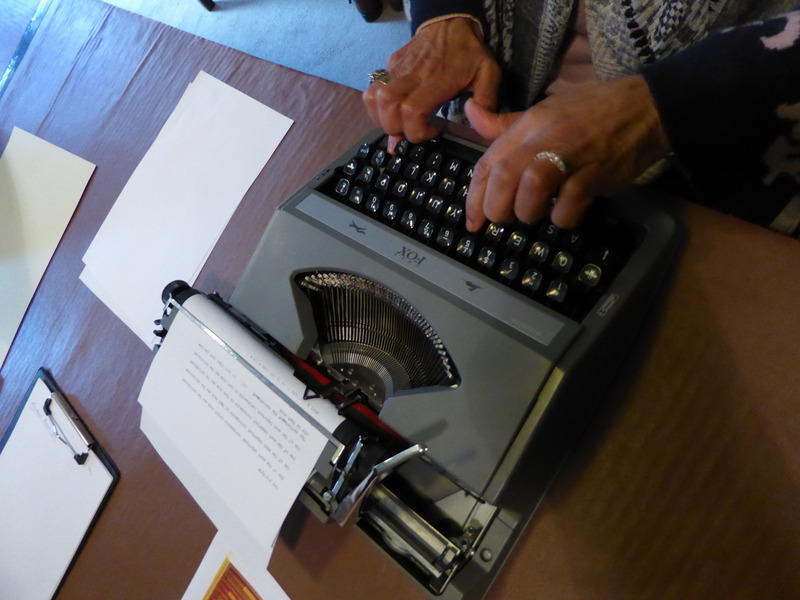 Older visitors reminisced about learning to type and the sounds of typewriters (ting). So the dwell time increased as visitors either shared experiences or had a go at typing (very popular with family groups). And my typwiter survived the experience - built to last! This is a unique project I helped to organise for the National Trust over the last 10 months. All started with paperwork then ended up with wood, concrete, scaffold poles and power tools. SOCKS AS A TIMELINE? NO WAY? Watching an old episode of the BBC childrens’ “Me Too” I was laughing then pondering the use of 100 socks to represent a 100 year old timeline to introduce changing clothes fashions. The teacher in this episode explained to his class that each sock represented a year. 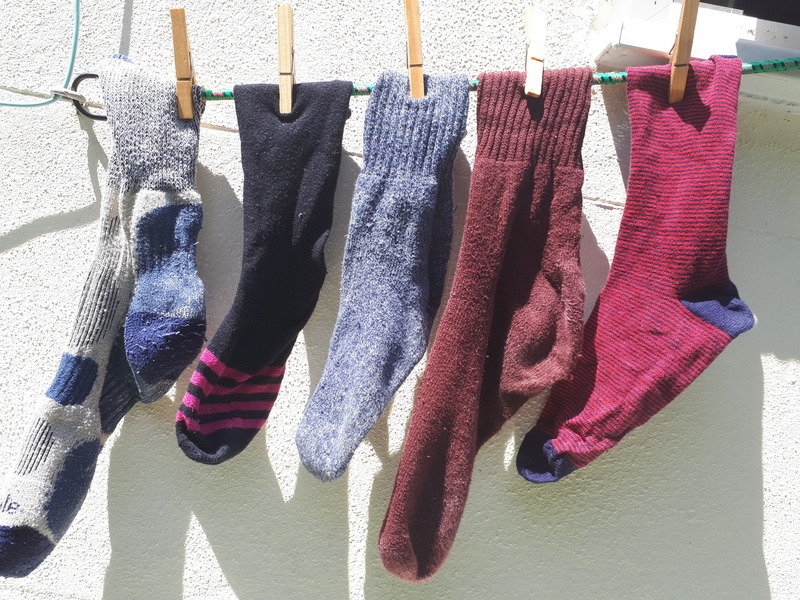 So, forty years was 40 socks down the washing line set up in the class room. What a great idea to capture anybody’s imagination who is usually turned off by a graphic wall of dates and facts. How can I introduce socks into my future heritage work? Not sure if I have a spare 100 socks. Mmmm…..well….. Proposed new Chartwell treehouse designed and to be built by Highlife for the National Trust. Note the slide on the left. This came out as the most popular ‘interactive’ demand from Chartwell visitors and consultation at Croydon Library. See article below. So my first surprise job for the National Trust was to organise the planning and build of a new treehouse at Chartwell in Kent, UK inspired by the one Churchill built for his kids back in 1923. 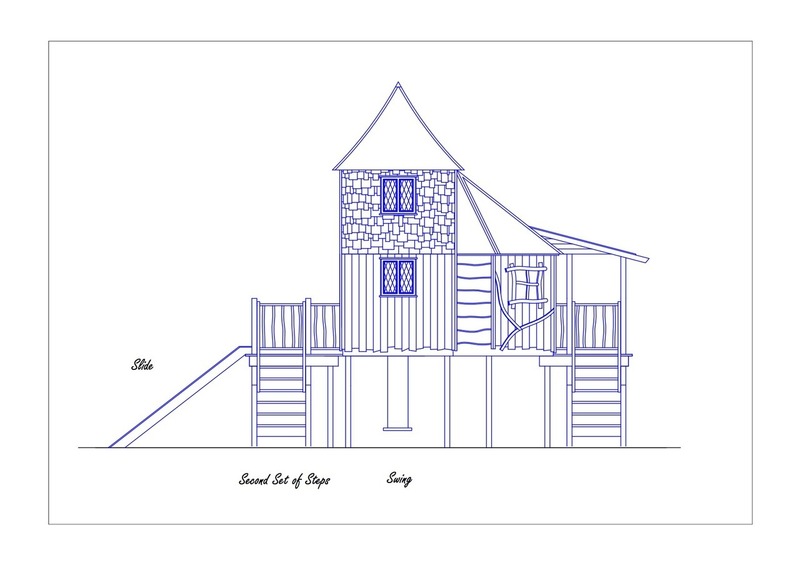 After a long planning procedure we now will be building it this summer in the woods at Chartwell. I never realised that treehouses fascinate people until I did some ‘market research’ at Croydon Library last autumn. It was one of those topics that people smiled at whatever their age. And then there is the history of treehouses that involves hermit priests, vain princes, merry Parisians, DIY part-timers and of course architects. 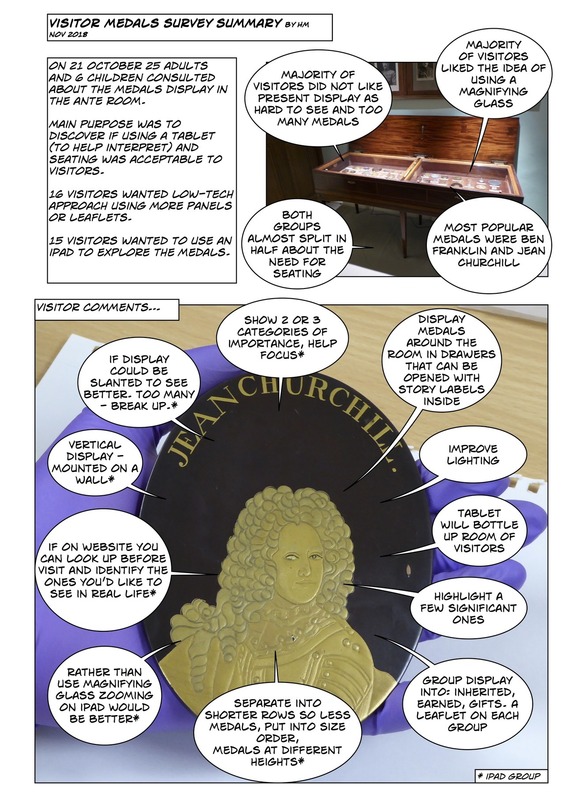 Coming next for me…commissioning replica medals (and other objects) as part of a Heritage Lottery funded education project for Chartwell. This house with amazing gardens and woods was the family home of Winston Churchill, now part of the National Trust. 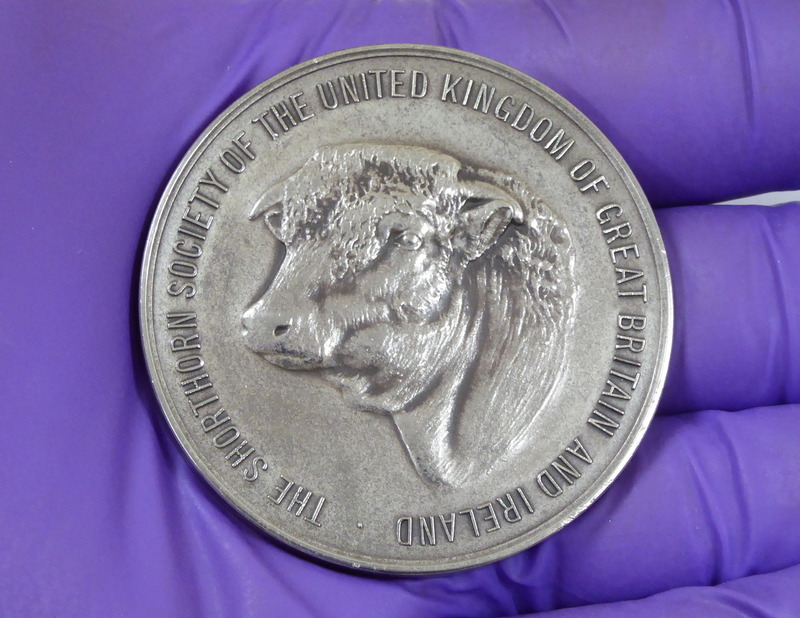 This medal show his favourite dairy cow Beatrice who won top prize at the Kent County Show in 1949. From freelance to starting work at the National Trust. It’s been a busy year! Sound cushions interactive at High Lodge, Thetford Forest, Norfolk, Forestry Commission, England. Part of unique Sound Trail, not including the jet sounds above. 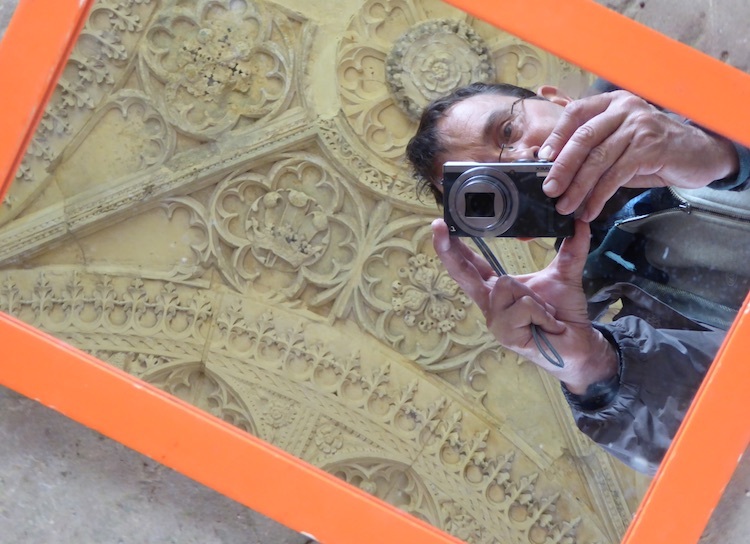 ENGAGE THOSE AUDIO SENSES - a call to museums, galleries and heritage sites. 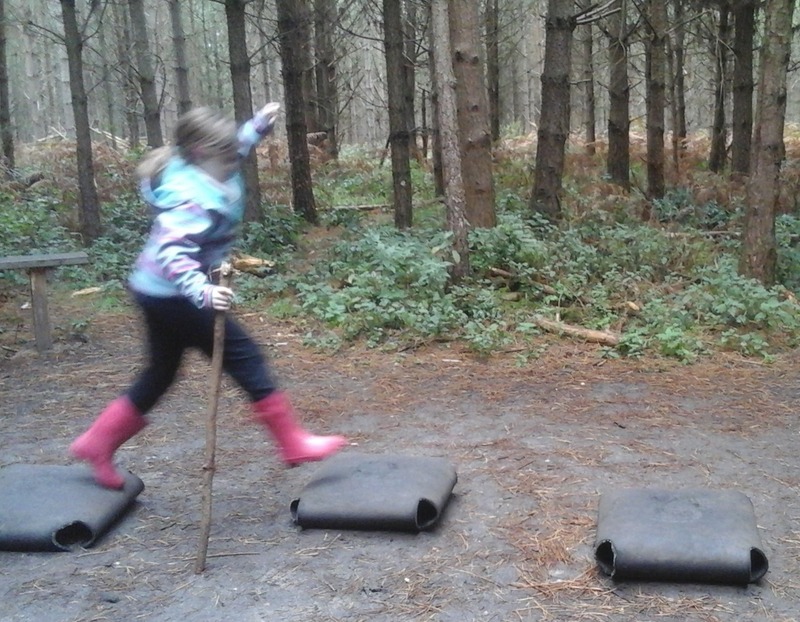 This week I had an epiphany on a family visit to High Lodge in Thetford Forest, Norfolk. As well as wow huge outdoor play equipment and a sculpture trail they have a… sound trail! When I looked at the handy mini map, as provided by the Forestry Commission, I scratched my head and said, “no way is this possible – sound interactives, outside?” Just then a military jet boomed overhead as it soared away from the airbase next door. Can you imagine a more difficult brief than creating sounds in the middle of a forest with no access to electricity or digital technology? So the designers came up with low-tech methods including squeaky woodwind ‘cushions’ you could jump on (see photo above) and huge metal glockenspiels! This really slowed down my family as we all wanted to have a go on these simple interactives. It created a special atmosphere as we became aware of the different areas of the forest. This Thetford Forest experience made me realise (again) that many museums, galleries and heritage sites are not daring to use simple audio interactives as a method to engage their visitors with a vital sensory tool. Perhaps they cannot be prepared to take risks (attitude or budgets?) like the Forestry Commission can? We should all go down into the woods today and discover simple audio ideas before the bears start their picnic. My new job as Visitor Experience consultant for the National Trust at Chartwell started last week. I am helping the team to interpret stories about Churchill (yes, he of hats and cigars), his family, staff and friends. First project: build a tree house! I am amazed by the gardens, very calm. 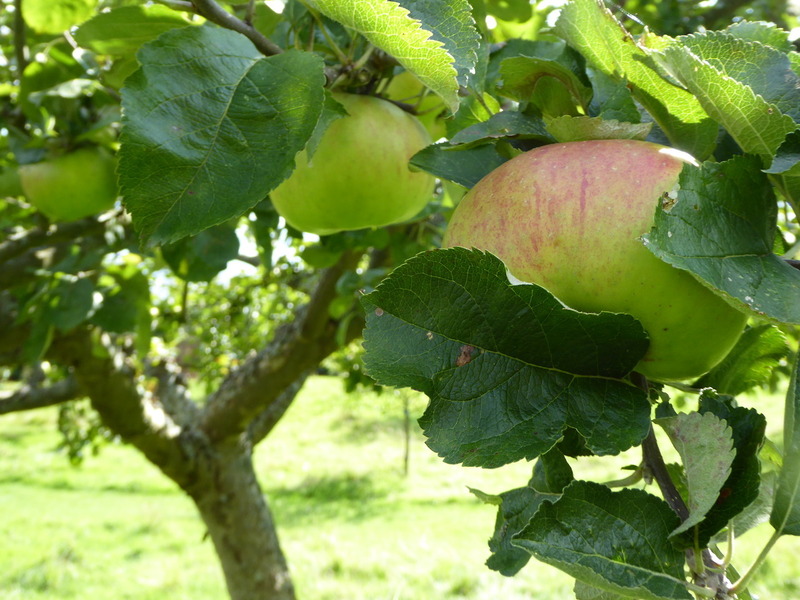 If you sit on a bench at lunchtime you can be gently surprised: watch the apple trees rustling in the wind; swifts dancing high above; visitors chatting in the distance; the ‘plop’ of a conker pod falling down and opening its treasure in the grass; and an aloof Jock the cat wandering by to hunt mice. Hats off to Mr Churchill for designing this unique space. 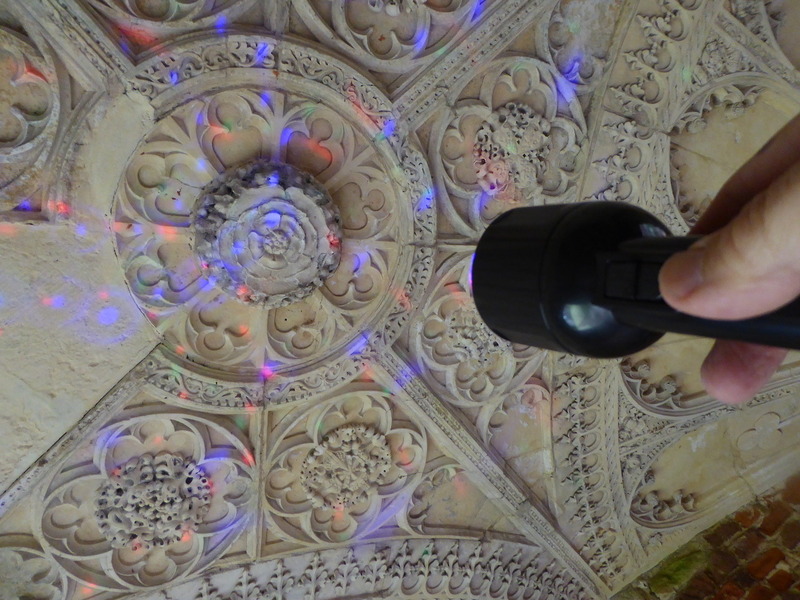 TUDOR DISCO or experiments with a ceiling, mirrors and a torch. Last month I was busy training the staff at the Cowdray Heritage Trust with a new style of tour in the empty shell of the Cowdray Ruins. This was once a huge mansion damaged in 1793 by fire then ivy and the weather. To help staff interpret the stories I tested simple low-tech props (inspired by the classic BBC TV game show The Generation Game) for visitors to use. My favourite ‘room’ is the Tudor Porch of Honour built for Henry VIII. It has the remains of an amazing Renaissance carving on the ceiling. This space became my ‘play’ laboratory as I used different types of mirrors to view the detail such as finding four faces hidden in all the delicate carvings. I then pondered about the use of colour. If you have seen an earlier post (D.I.Y Nature Trail) I mentioned my childhood memories of I-SPY. See in this photo 3 examples I found in the attic. Back in the 1970s I used to collect and swap these booklets with other kids in the neighbourhood. They were written by Big Chief I-Spy. If you completed a booklet and got high scores for answering the questions you could get an Order of Merit (we were easily pleased back then). I never got to the top score but it did make me stop and look for clues either on a rainy day or long boring family car travels. Remember, this was years before the web or mobile apps. I really liked ‘THE SKY’ booklet as it echoed the huge following of the Space Race in 1970s. The I-SPY series has been rebooted but with glossy photos seems to have lost the original feel. Working in heritage interpretation there are still lessons we can learn from these wee books: keep it cheap; keep it simple; keep offering prizes; keep them coming. It’s official. 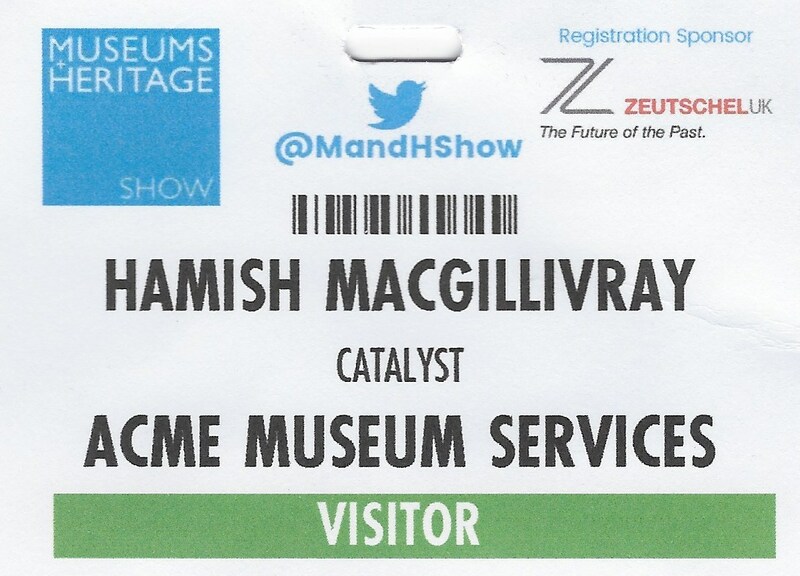 I am a heritage catalyst. Now to find the magnesium ribbon…. Here is my quick guide to museum interactives over the last 100 years or so thanks to a certain Time traveler author. This has just been published in the Association of Heritage Interpretation summer 2017 Journal. Spot the typos (ahem). It was a fun article to write as I was determined to get away from traditional academic blah blah writing. D.I.Y. NATURE TRAIL or WHAT POO IS THAT? Last weekend with friends and a gaggle of kids (4 yrs to 11 yrs) we set off to discover the 480 foot (146 m) high isolated Mount Caburn at the Sussex south coast, UK. It’s supposed to be the remains of an Iron Age Fort but with over 100 burial sites archaeologists now think it was a huge posh graveyard for the Celts to dominate the valley below. In the rush to prep the picnic I also made simple hand drawn trails in 3 notebooks to keep the kids occupied and get them to do some looking around, see photo above. Despite the fierce wind the kids really got it into the trail and with my trusty sticky tape we even created a mini flower press. As there was lots of animal poo, on the slopes, the kids became fascinated in also identifying that yuk stuff. So we recorded that new evidence and stuck in some genuine sheep’s wool. After the visit I realised that: 1) You don’t always need an app to explore, low-tech is very practical esp with the British weather. 2) I had in fact based the D.I.Y. 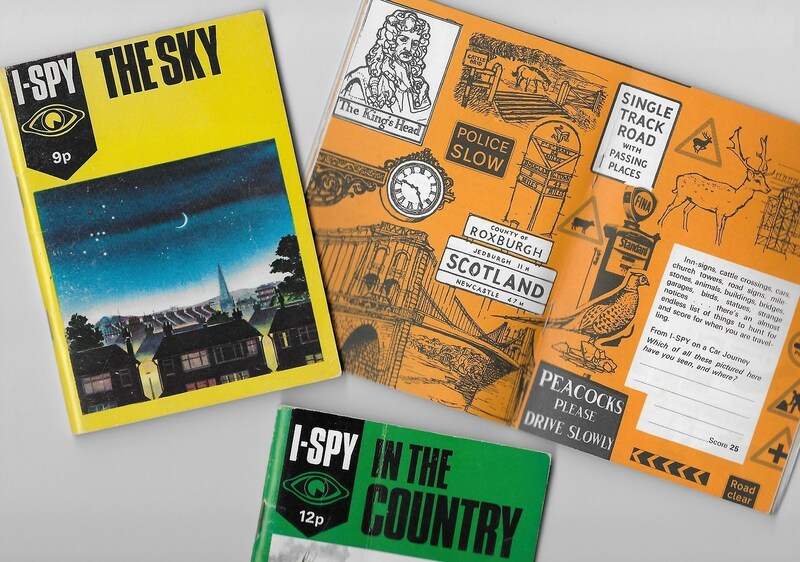 trail on my childhood experiences of using the classic I-SPY series of booklets from the 1970s. Here’s a short video I made 11 years ago using stop motion animation to recreate the scene when I presented my exhibition ideas, in 2005, to the Crystal Palace Football Club management and sponsors. This was to celebrate the Club’s centenary anniversary funded by Croydon Council and Nestle. I think the management were expecting some flashy videos or graphics, instead I plonked a toolbox on the table and took out these toy bricks and recycled card to represent the profile of the 3 main stands at Selhurst Park. I declared (after lots of discussion with fans before) that they could echo the design of the stands in the exhibition build. It was a successful presentation and we got the approval to proceed with the project. I have used this DIY craft technique for presenting layouts for exhibitions at the Lightbox: ‘Alien Invasion’ and ‘The Story of British Comics So Far…’ For more about the Crystal Palace Football project, see the WATCH page on my Acme website. I was part of a wee team that only had 5 minutes to talk about the tools in our ‘kitbag’. I opened my presentation by declaring “…sisters and brothers we are all catalysts…” then focused on benefits using Comic Life software, see photo below, and use of toy bricks and card to communicate themes at start of an exhibition project, see above in the next video. And yes, the original King Kong is in the background. Over the last 10 years I have also used Comic Life to present potential themes and ideas at the start of a heritage or gallery project. 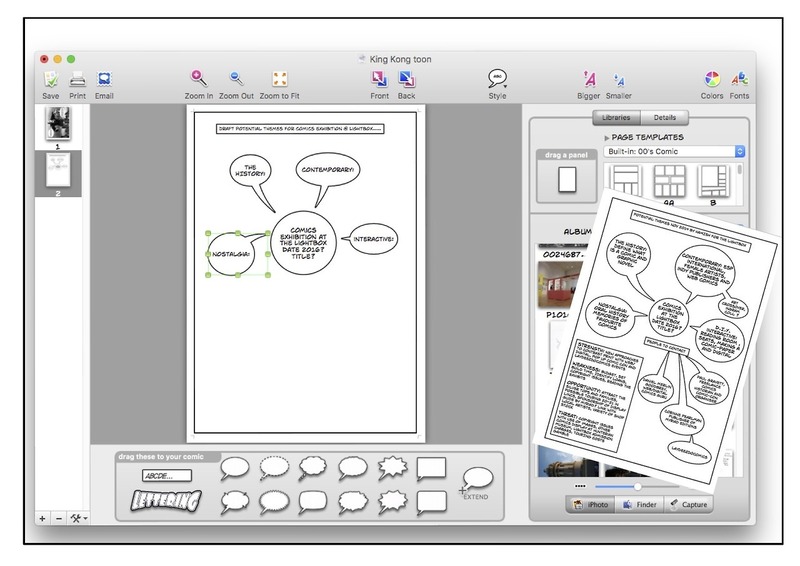 I just use the Comic Life speech bubbles to create ‘spider diagrams’ or now called information graphics. You can see in the photo I am working out the themes for the Comics exhibition at the Lightbox and editing the text to the bare bones. The final result is the overlay on right. It’s great for formal presentations as it’s eye catching. For Heritage Lottery applications it’s very useful to break up the monotony of Word or Excel documents with a clear page of ideas created in PDF format. Here is a video I just edited on behalf of the Hayward family to show some examples of the late Julian Hayward’s paintings and prints that he created after he retired from teaching furniture design. What was fun was to use Robin Haywards (son of Julian) microtonal tuba music as audio on this video collage. The artworks you see and more will be on display this summer at the Grange Gallery in Rottingdean, near Brighton, UK. PUFFIN CLUB. EVENTS BLAST FROM THE PAST. Found these amazing magazines from the 1970s Puffin Club that I joined as a wee lad. This was the ‘youth wing’ of Puffin Children’s Books aka Penguin Books. 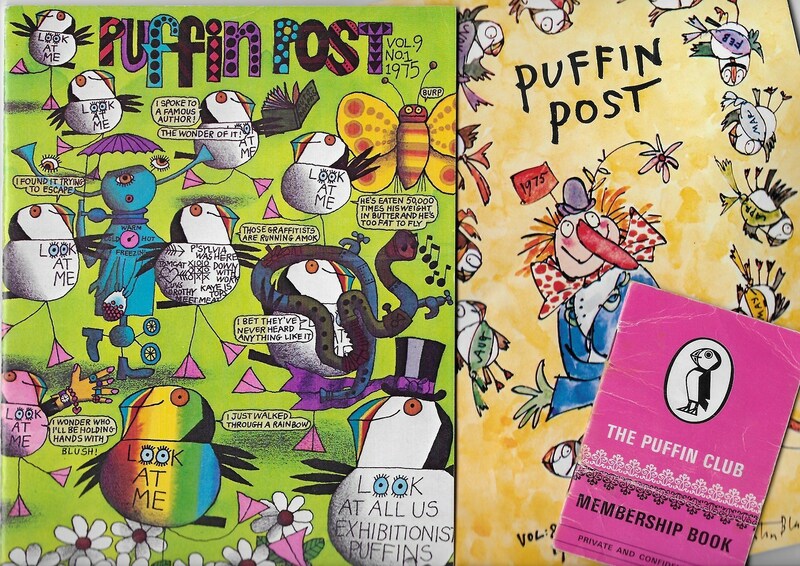 The ‘Puffin Post’ magazine was like a grand chaotic school magazine production with a mixture of short stories, word puzzles and cartoons, Quentin Blake made illustrations for the Post. The back pages had the proactive ‘Puffin Happenings’ section for children to join their local Puffin Club meetings for games and meet a children’s author or book illustrator. I remember going to hectic Puffin meetings with games, involving words of course, in large gardens and saying ‘hi’ to a terrified author, then demanding a choccy biscuit. I am amazed at the organisational skill and data collecting the Puffin Club did in 1975, long before affordable computers and social media. Looking at the old ‘Puffin Post’ pages there is a big tip for museums and heritage sites today how to engage with children and families: create regular fun events and newsletters. Some of my travel journals with work in progress or doodles. A spiral bound notebook also on show with origins of comics history interpretation ideas. What’s in my kitbag? Part 2. TRAVEL JOURNALS. The most essential bit of my kit are travel journals. I used tiny lined notebooks from Rymans which were fine for lists but useless to show ideas in meetings. But, one day I walked into an art store and discovered the Seawhite of Brighton travel journals. These books for me are a mixture of a notebook and sketchpad, with heavy cartridge paper ideal for: doodles, spider diagram plans or even water colour drawing. The A6 versions have alternate lined pages. They also have a ‘secret’ inner pocket so you can keep business cards or old ticket stubs or anything else wee. The other big advantage of these travel journals is that they have a chunky feel and are protected by hardback cover (ideal for tea mugs) with a handy elasticated band to keep the book closed. At the moment I have 2 journals on the go, an A5 for work ideas and an A6 for everyday inspiration and doodles, see the photo above. I also use the A6 travel journals as a mini scrapbook if anything from newspapers or magazines catches my eye. 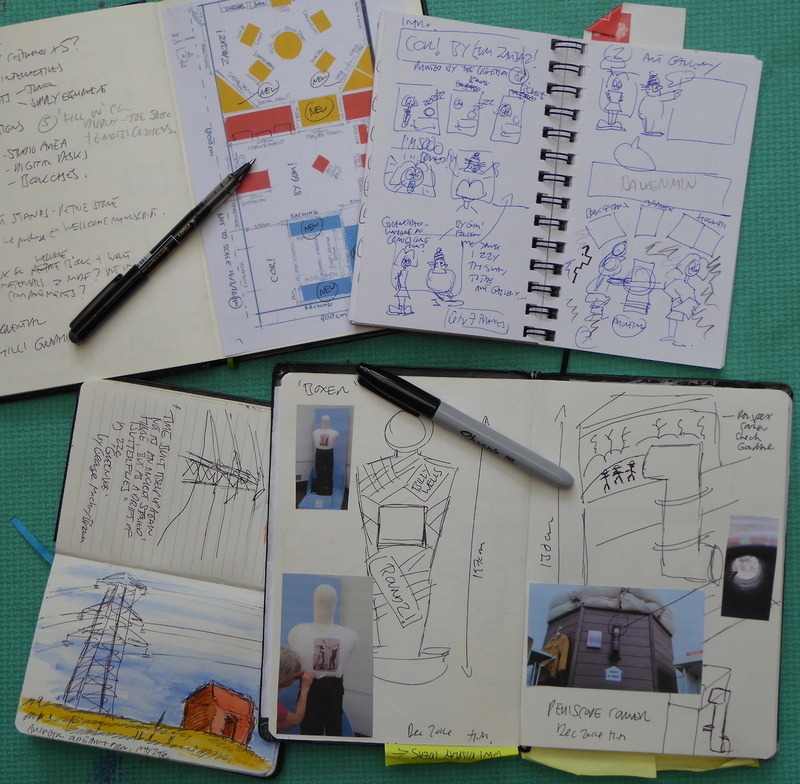 I often use the A5 travel journals for presentations as easy to show ideas in progress. Unlike smartphones the travel journals don’t need a battery. Here is some 1978 footage that was donated by Ken’s wife at a memory day for the Friends of the Pepper Pot. What I like about this video is Ken’s keen enthusiasm for visitors to explore his electro-sculpture by themselves; and for arts and science to work together. This was also the ethos of the Experiments in Art and Technology group of artists and engineers in 1970, based in the USA. And now that sense of exploratory learning is back with the STEAM education movement as seen at The Exploratorium. 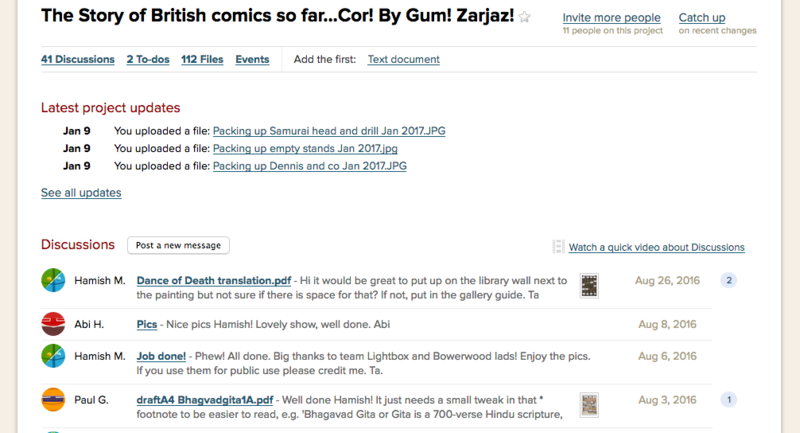 A screenshot from my Basecamp account showing the discussion page on the comics exhibition I organised. See text below. I discovered Basecamp project management software in autumn 2015. The podcasters on Radiotopia at that time were raving about it as a very user-friendly experience and no Gantt charts in sight! I was amazed by the basic idea that it was a mixture of: a private Dropbox; private group email system (you invite your team or clients to join a particular project); and you create as many of lists of to-dos (or tasks/milestones). You gradually tick the tasks off when you meet that deadline. It gives you a very satisfied feeling that the list is getting shorter. I started using Basecamp for behind-the-scenes organising and keeping in the loop all the main people involved in the comics exhibition ‘The Story of British Comics So Far…’ The clients at the Lightbox and my co-curator appreciated the group discussions we could start if one of us uploaded a document such a draft press release or image of a potential loan, see screenshot above. And now the exhibition is finished the timeline of discussions is so valuable for evaluation and as an archive for future enquiries. Just have to watch the software price as started as £12 per month and then after the Brexit vote it has creeped up to £16. But, I think it’s worth it as an organisational tool. It has has helped me find and share documents or images very quickly rather than wasting time searching files on my laptop. And you can use it as an App on your smartphone. Try writing a series of museum labels translating these fantastic accents! Happy Burn’s Night to the Caledonian clans. 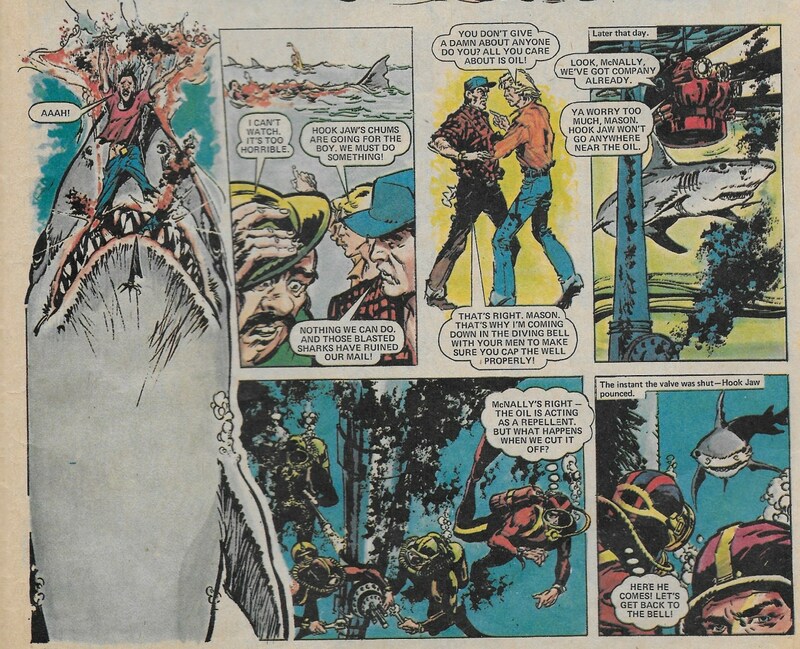 Top: Hookjaw from 1976 Action comic. One of my love/hate jobs in museums are exhibit labels. I can spend ages writing a short, snappy text label. Then I get depressed as I observe visitors drifting by my mini-masterpieces not reading any labels in the gallery. I also start banging my head when I read surveys that say only 30% of museum visitors in fact bother to read anything at all. So what to do? Traditional museum management love the got-to-have-a-text-label-for-all-display-exhibits. This can mean writing lots of text for a huge 3D book! However, I have been thinking for years why not approach museum text labels like the structure of a comic or a graphic novel? Writing a script for a comic takes some serious editing skills to grab the readers attention. And you are often working in a team with a an artist making your words into a wow scene as seen in the classic Hookjaw from Action, see gory picture above (script by Ken Armstrong, art by Ramon Sola). Taking those comic elements I have managed a wee experiment with my latest exhibition “The Story of British Comics So Far: Cor! By Gum! Zarjaz!” at the Lightbox in Woking. As this is an exhibition about comics all the labels have to be in cartoon bubbles! And why not get some foamboard ‘guides’ to show visitors the highlights of each display section? Enter my characters Grandad Alan and his granddaughter Zara. They are brought to life by the amazing Asia Alfasi, see pictures above. And if you have 3 ancient loan exhibits of early sequential comic art why not ‘translate’ them as a comic? See my example that I designed with Comic Life software of the 3000 year old Ancient Egyptian hieroglyphic stone from the Petrie Museum. My casual observations at the Lightbox is that visitors of all ages spend more time reading these speech bubbles than the traditional museum yawn square box versions. 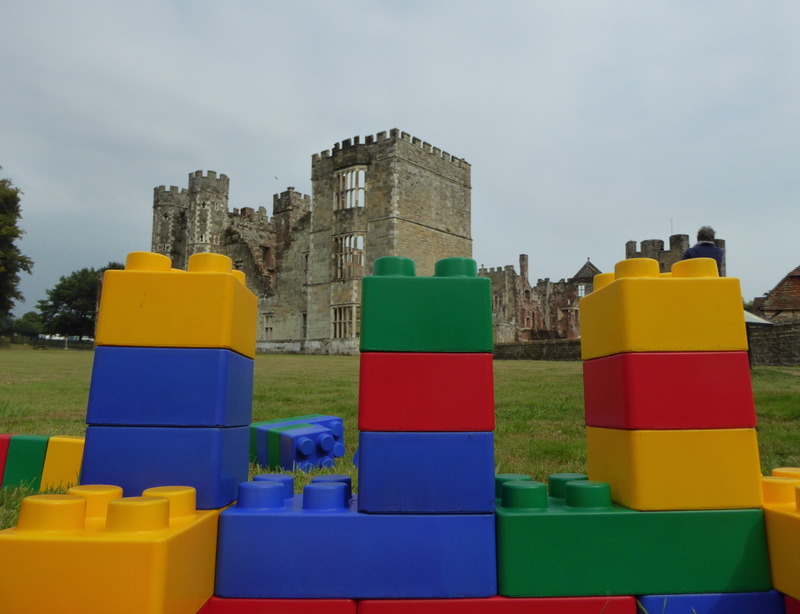 Some simple interactive approaches for Cowdray Heritage Trust, see wee article below. How do you grow your low-tech interactives? 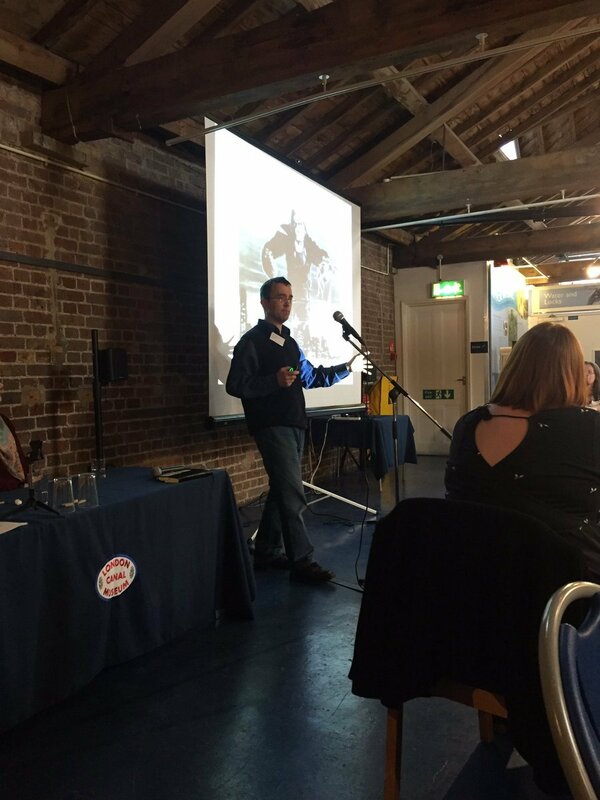 This summer I advised Cowdray Heritage Trust on developing some ways of engaging family audiences at the Cowdray Ruins in West Sussex. Ever heard of this place? Well google and you will be amazed by the political history that this place used to to be fizzing brightly like a firework. Visitors included Henry VIII, Queen Elizabeth I, a butler who became notorious as Guy Fawkes, the top 17th century British chef Robert May and later the artists Constable and rival Turner. Alas, during a fire in the 18th century the main buildings and wow art collection all went up in flames. All remaining today are the tall walls, some chimney stacks and a tower with a view. So how do you get family groups to stop, pause and look around? There is a very good audio tour guide but I liked the quote from one of the volunteers who remarked “walking in the footsteps” of the famous celebs and not so famous staff. So how about walking in the footsteps of the builder of this Tudor palace? 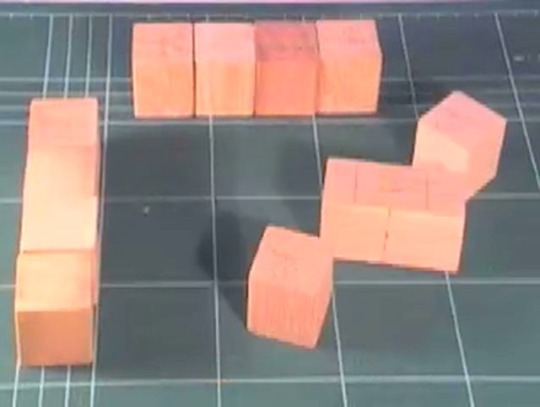 Get some giant Lego-type bricks and ask visitors to build some walls. How about a bit of hide-and-seek and see if visitors can spot anybody up on the walls? Could that be Queen Bess? Or a shifty servant up to no good? Get local artist Traci Moss to loan her collection of 5 recycled Bob sculptures and place them in strategic places. 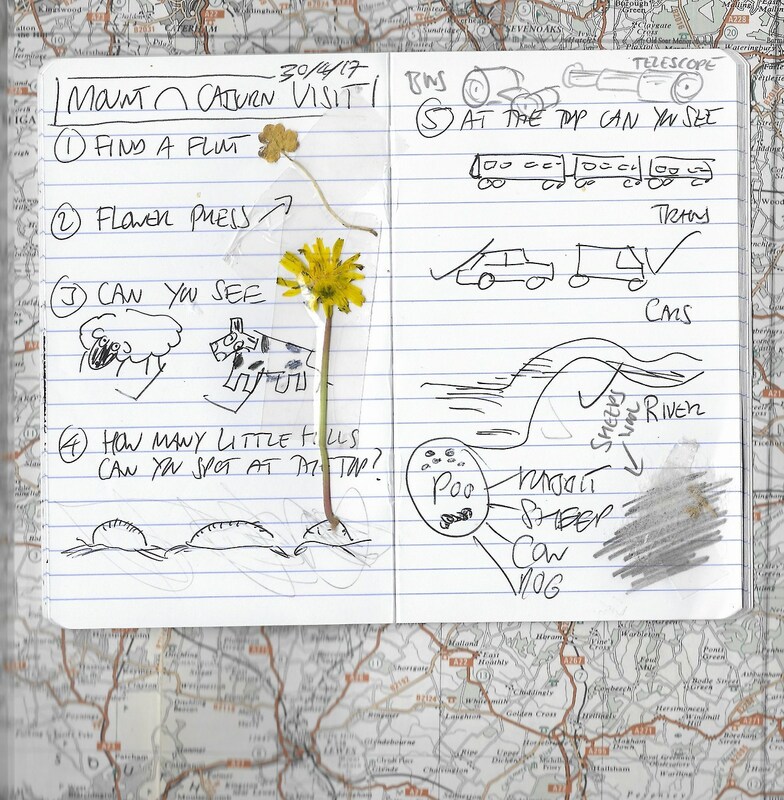 Then give visitors a mini Bob trail leaflet and stickers. Bob’s your Royal! See the pics above for this wee experiment. We will see if these interactive ideas will grow next year. Behind the scenes photos of Lightbox team, Bowerwood set builders, Paul Gravett and I installing the exhibition “The Story of British Comics So Far…Cor! By Gum! Zarjaz!”. Install at the Lightbox in Woking between 25 July to 5 August 2016. Planning, script, layout design and loan negotiation (with museums and private collectors) took 18 months. Exhibition is now open until 31 December 2016. 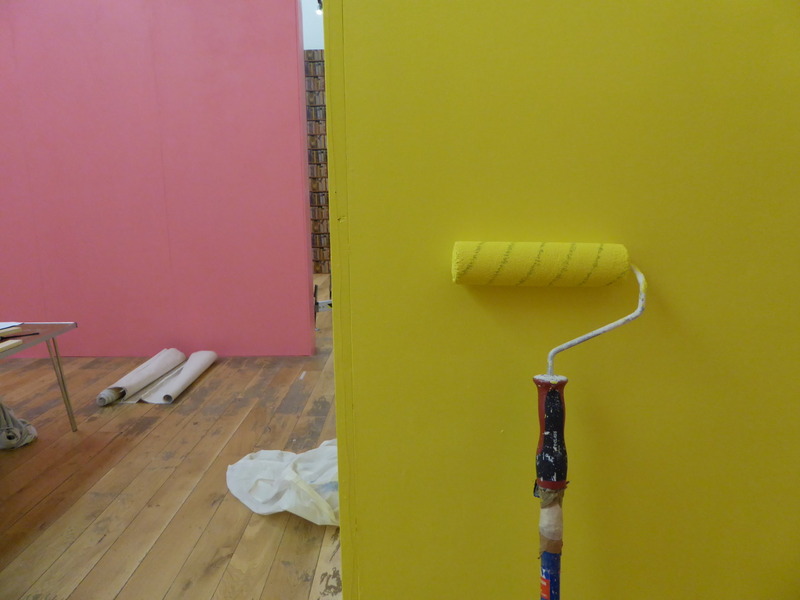 A bit of cut and sticky tape to get a real feel for my exhibition layout for “The Story of British Comics So Far: Cor! By Gum! Zarjaz!” at the Lightbox. 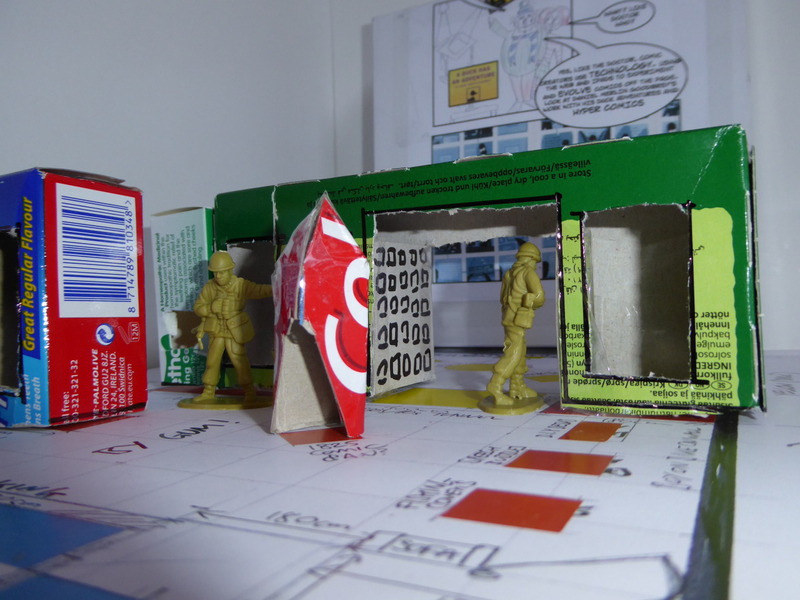 Some sticky-tape, toy soldiers and recycled boxes. Hey presto! A comics exhibition emerges. You can use the best CAD designs to design an exhibition but really the best way to get a feel for a new layout is to make a model. Some architects spend thousands of pounds on amazing scale models built by skilled hands. A great example is at the San Francisco Museum of Modern Art in which as part of planning a new gallery they commissioned a model maker to make a scale model of the new building and then over 4 years he made mini versions of the 2000 artworks “which have been moved around by the curators to see how effective different hangings are” (quote from Guardian 23 April 2016). Me, I just grab some plastic toy soldiers and start mucking about with a ruler and old food packaging that I can cut with a scalpel and bend with sticky tape. Photo above is my latest rough and ready model for the Lightbox in Woking. At this stage I was working out a brief for the set builders for “The Story of British Comics So Far: Cor! By Gum! Zarjaz!”. Doing it this way, like the team in San Francisco, made me consider sightlines. Lets see it become a reality on 6 August. “Time built itself up again, not as an ancient storied house, but as a drift of butterflies.” How do we present TIME? 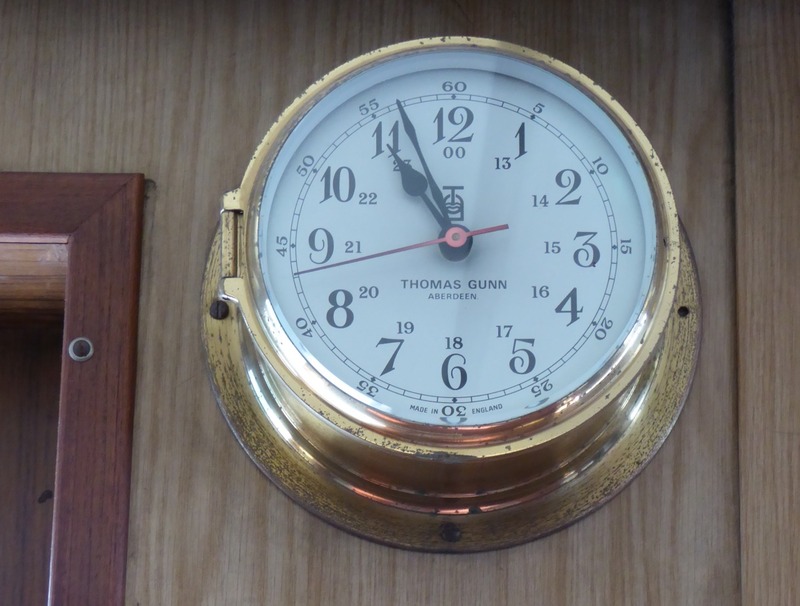 In museums and heritage sites there is a big focus on timelines. This helps visitors to see quickly the sequential history of a site or person. And at the moment schools love them as a useful tool. I and colleagues developed such a timeline to present the highlights of a First World War training camp in Sussex. 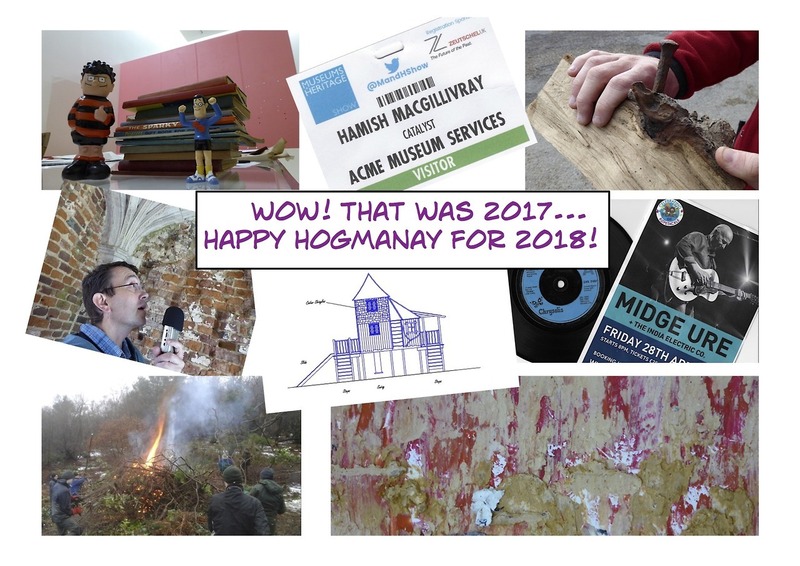 But… after dotting around different historic sites in Orkney, like somebody in a battered flying police box, visiting a 2000 year old fort then to a 300 year old dovecote and yomping down the road to a 7000 year old historic site, did it matter about the correct order of time? On a very windy ‘lambing snow’ visit to Orkney I came across Skara Brae. This is the best preserved collection of prehistoric houses in Western Europe. What impressed me with my curators woolly hat on was the amount of interpretation on this site. I think Historic Scotland has done a lot of thinking. Inside the wee exhibition site were a unique style of labels that were so honest that explained the ‘experts’ did not really know much about who had lived here 5000 years ago. What was even better was the outside timeline. As you go outside you notice this curious sign on the old wall (see above) and then as you walk down the path to the prehistoric site you notice stone markers with important dates carved on them (see below photo). You then realise, with a chuckle, you are looking at a timeline! I found it a very clever way to have this minimal information as you walked and not bombarded by colourful graphics. 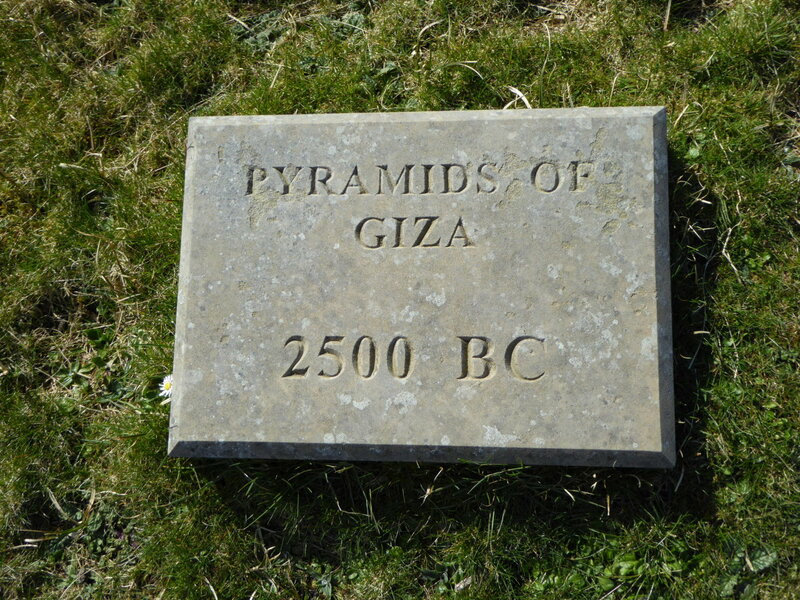 Great introduction to the site and making you become a time traveller in the wilds of Orkney. An example of the amazing outdoor timeline that Historic Scotand have developed at the prehistoric site of Skara Brae, Orkney. Visitors start in 20th century with important dates such as Neil Armstrong and co landing on the Moon. 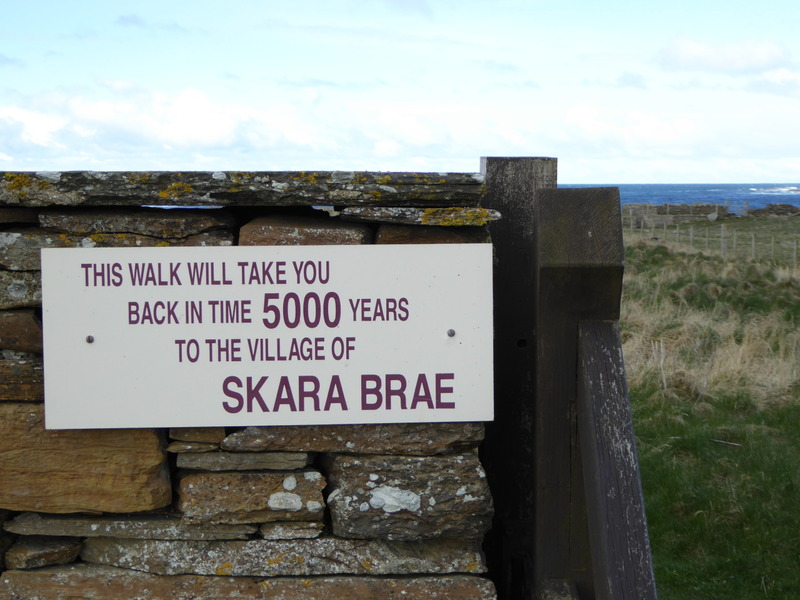 Then the stone timelines count down major historic world events, as you follow the path, counting down to 5000 years ago when Skara Brae was a living village. Hey presto! 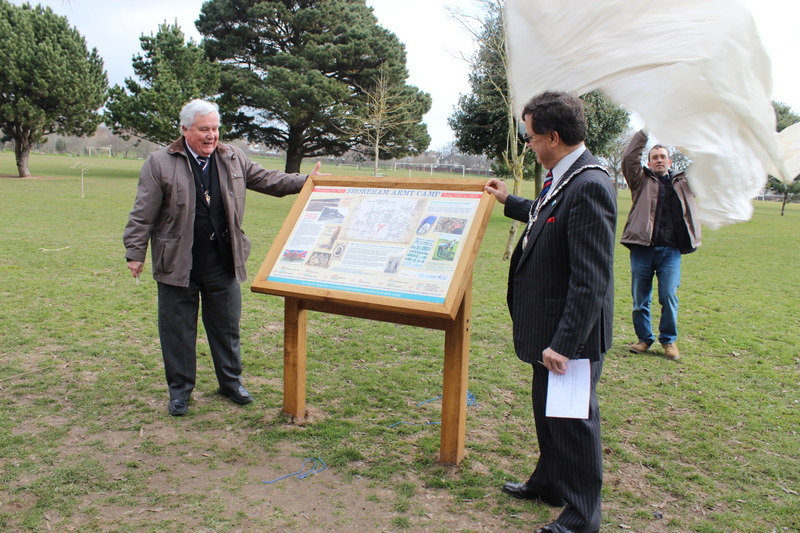 On a freezing windy day, last week, the Mayor of Worthing (left) and Chairman of Adur District Council (right) ‘opened’ the #WW1 information panel at Buckingham Park the site of Shoreham Army Camp 100 years ago. I am in the background catching the dustsheet parachute before it flies into the bowling green. The things we do as curators. We were never warned about this at college! 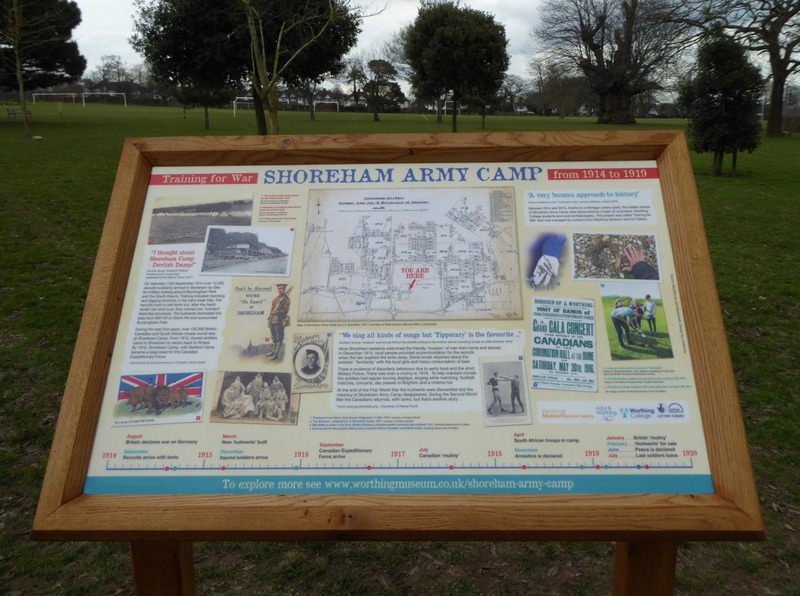 The new information panel I helped to create about the hidden history of WW1 Shoreham Army Camp next to the South Downs in West Sussex. Job done. After organising some amazing #WW1 Shoreham Army Camp events and workshops last year with the team from Worthing Museum I thought that we would wrap up by October 2015. Especially as the funders Heritage Lottery Fund are strict about deadlines. I was especially proud of the touring pop-up displays that I designed the exhibition kit for. Normally with temporary displays they last 6 to 12 months then after the tour everything gets dispersed or recycled. 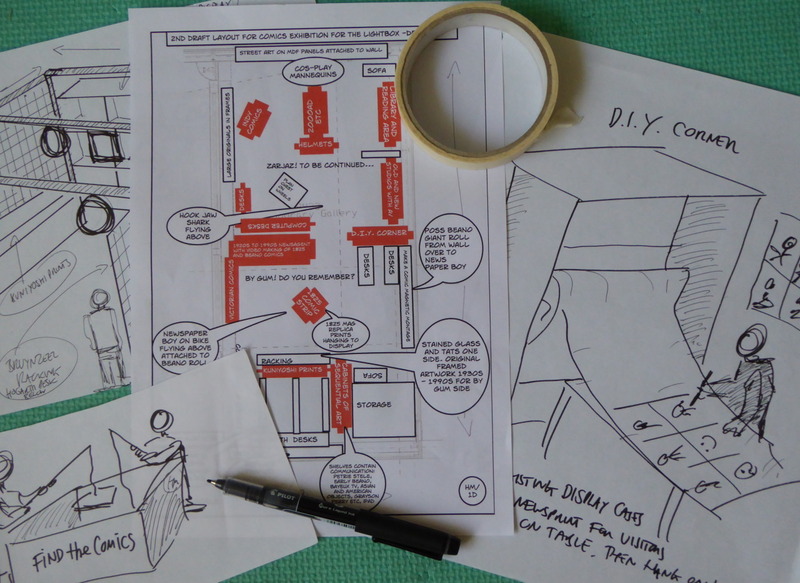 In my freelance bit working out the layout for the comics exhibition to be held at the Lightbox in Woking end of August. Title so far is ‘The Story of British Comics so far… Cor! By Gum! Zarjaz!’ However, whenever you think you have a unique exhibition, suddenly 2 other venues, thinking the same way, announce they are putting on similar exhibitions. An example: I have just seen that the Hunterian Art Gallery in Glasgow are doing a ‘Comics and Culture’ exhibition from March. Small world. But I think it will be different themes from what I and the team at Woking hope to do: what is a comic? nostalgia and the future of comics. The other problem in an exhibition like this is searching for copyright permissions for PR or printing a leaflet. Some of the older comics we hope to show such as 2000AD have such a complicated history of different owners. But on lighter side thinking how to design simple interactives for under 5year olds in this exhibition as well as for adults. 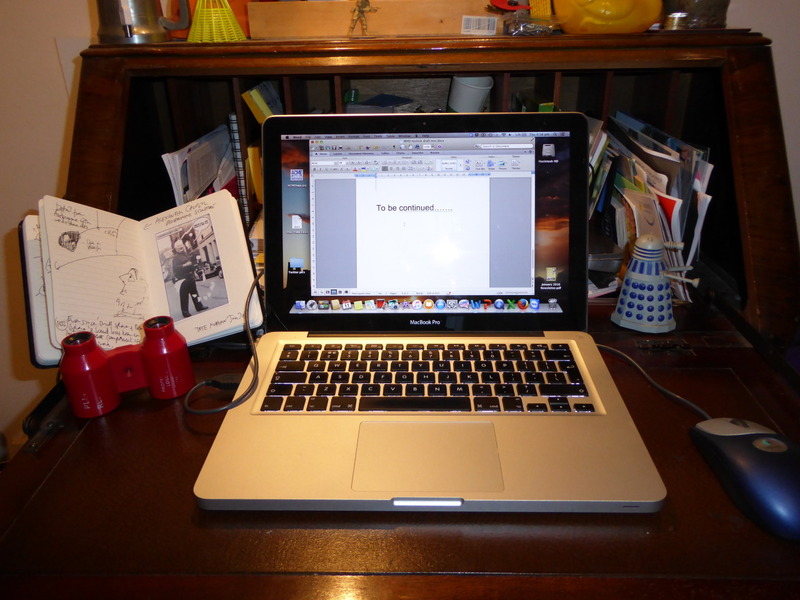 21th century laptop with 20th century bureau desk. Perfect for each other and the Dalek. Just starting up this blog so testing it all. Using a laptop on my grandad’s fold down old bureau. Not a precious antique - just a really, really useful bit of family furniture that is so versatile. It was one of those items that was supposed to be dumped but fortunately family wisdom kicked in and saved it. I gather it was used by my grandad to calculate the receipts from the milk round he did in a battered Morris MInor van around North East Scotland.